Secure Your Surrey Home With The Best Home Insurance Coverage Buying your own house is possibly the biggest investment you could make in a lifetime. 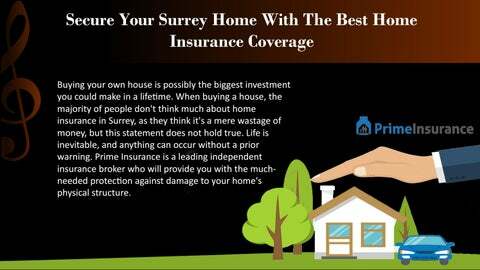 When buying a house, the majority of people don't think much about home insurance in Surrey, as they think it's a mere wastage of money, but this statement does not hold true. Life is inevitable, and anything can occur without a prior warning. Prime Insurance is a leading independent insurance broker who will provide you with the muchneeded protection against damage to your home's physical structure. Why Choose Prime Insurance? Prime Insurance understands the essential role played by the property in your life. Our home insurance keeps your house protected against different kinds of dangers, including accidents, thefts, and natural disasters. Prime Insurance is a top-notch independent insurance broker who has consistently been providing high-quality home insurance services in Surrey at competitive rates. Located in the Fleetwood area of Surrey, BC; we have been working with clients all over BC since 1994. However, we primarily work with those in the Lower Mainland. What Makes Us Different? 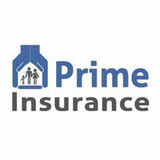 We, at Prime Insurance, provide every client with individual attention. Our highly trained staff with relevant experience under their belts analyze the needs of our valued clients and help them choose the best insurance policy to protect their homes. We strive to achieve customer satisfaction. Our unparalleled service, regardless of whether it is in response to an insurance claim, or the delivery of the client's documents for the renewal of Autoplan insurance, is simply beyond compare. We work 7 days a week for your benefit, so we can help you not only manage, but plan for your potential risks. Our Goals At Prime Insurance, we work considering the following goals:To give you the right coverage. To provide you with the professional and outstanding customer service. To obtain the lowest available premium. To keep you satisfied at all times.